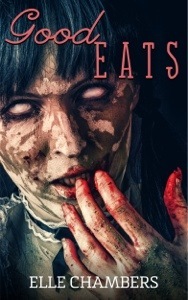 Attention all horror fans: Good Eats: The Deluxe Edition by Elle Chambers is free on Amazon starting April 17th and ending Friday the 18th. Don’t miss this sale! Good Eats: The Deluxe Edition is a 34,000 word novella that tells the story of the Crawford family in 1960s Louisiana. The Haitian-Creole people, their religion, Vodoun, and the rumors of hoodoo rituals have brought esteemed cultural anthropologist Michael Crawford, his nine-year-old daughter Libby, and his Haitian-Creole nanny, Virgine Santiago, to the area. Michael’s a skeptic of the Vodoun faith and hoodoo in general—until the day his daughter is discovered lifeless at the bottom of a creek. Devastated and unable to let go, Michael makes a deal with the local bokor (sorcerer)—bring his daughter back and the bokor’s debts will be paid for life. Two days later, Libby returns. The question is: as what? This edition also includes stories (“When Daddy Comes Home,” “Child’s Play,” “The Storyteller,” and “Old Flame”) from the Dark Tales series.